1891 Born 14 April in Mhow, Madhur Pradesh to Ramji and Bhimabai Sankpal. 1900 His surname registered as Ambedkar after a Brahmin teacher who was kind to him. 1907 Matriculated from Elphinstone High School, Bombay. 1912 Their son Yashwant was born, the only one of their 5 children to survive. 1913 Passed BA in English and Persian at Elphinstone College where he had studied on a scholarship from the Maharajah of Baroda. 1913 Moved to Baroda but left on facing intense casteism. The maharajah responded by giving him a scholarship to study at Columbia University. 1916 Moved to London and studied at LSE and Gray’s Inn for DSc in Economics and for the Bar. Moved back to work in Baroda without completing his DSc because his scholarship had ended. 1917 Left Baroda finally in November after experiencing caste discrimination which blighted all aspects of his life. 1918-1920 Professor of Political Economy at Sydenham College, Bombay. 1923 Awarded DSc after returning to London to complete his doctorate. 1927 Completed thesis and awarded PhD in Economics from Columbia. 1923 – 1951 Engaged in politics and in campaigns for emancipation of Untouchables (see next panel). 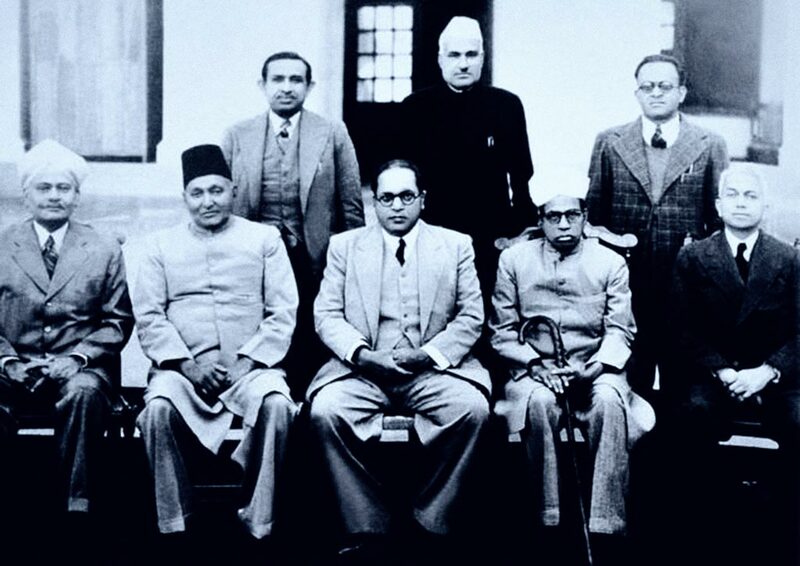 1947 Became Law minister in Nehru’s Government and chair of drafting committee for Indian Constitution. 1951 Resigned from the Government. 1948 Married Savita (nee Sharda Kabir)– a Brahmin doctor. 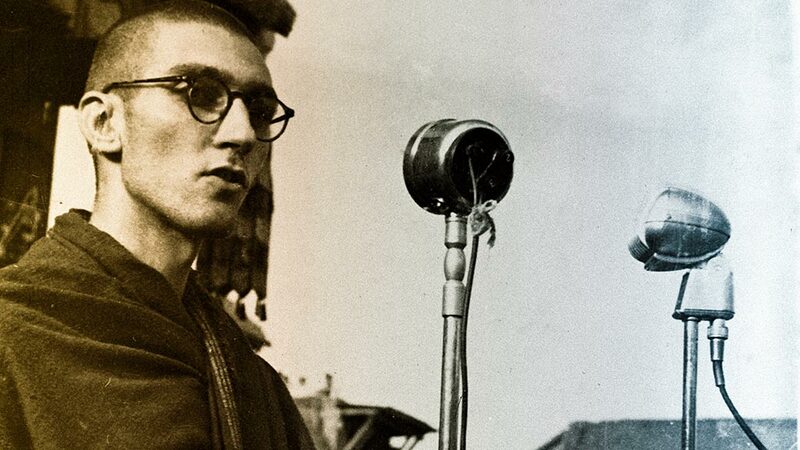 1951-1956 Devoted his energies to studying Buddhism and exploring the idea of the conversion of Untouchables. 1951 Started to write The Buddha and his Dhamma which was published posthumously in 1957. 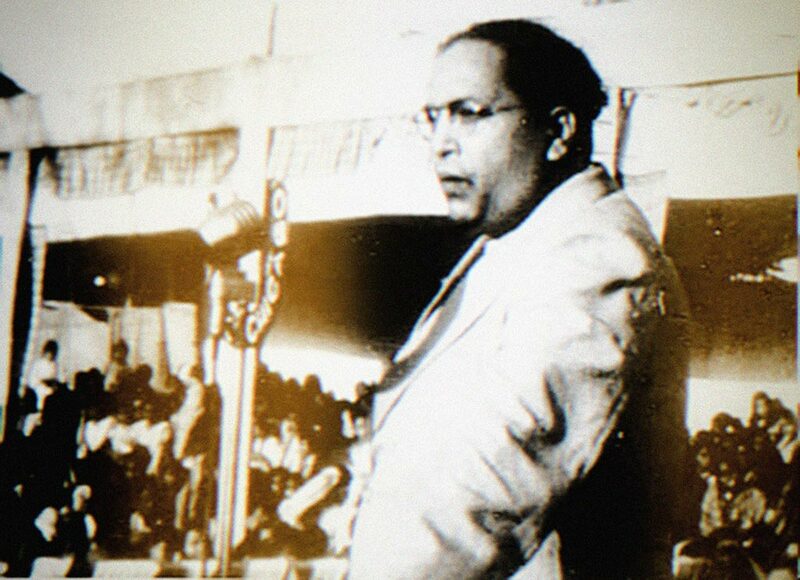 1956 On 14 October, Ambedkar converted to Buddhism along with 380,000 of his followers in Nagpur. 1956 Died 6 December, aged 64. 1924 Founded Bahishkrut Hitakarni Sabha (Depressed Classes Welfare Association). Its slogan was ‘Educate, Agitate and Organize’. This was the beginning of his leadership of the Untouchable movement. 1926 Appointed to Bombay Legislative Council and gave evidence to the Royal Commission on Currency and Finance. 1927 Chowdar Tank demonstration – From this time on Ambedkar was actively challenging attempts to keep Untouchables within Hinduism. 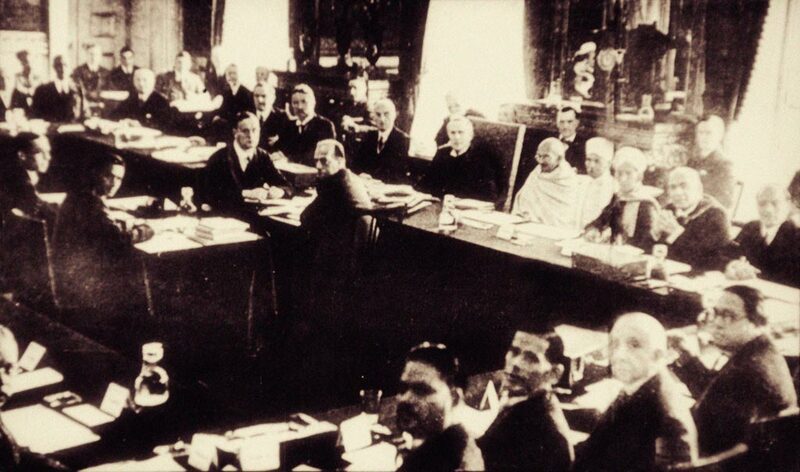 1928-1932 Spoke at conferences called by the British to explore constitutional reform on the road to Indian independence. 1932 Conflict with Gandhi. 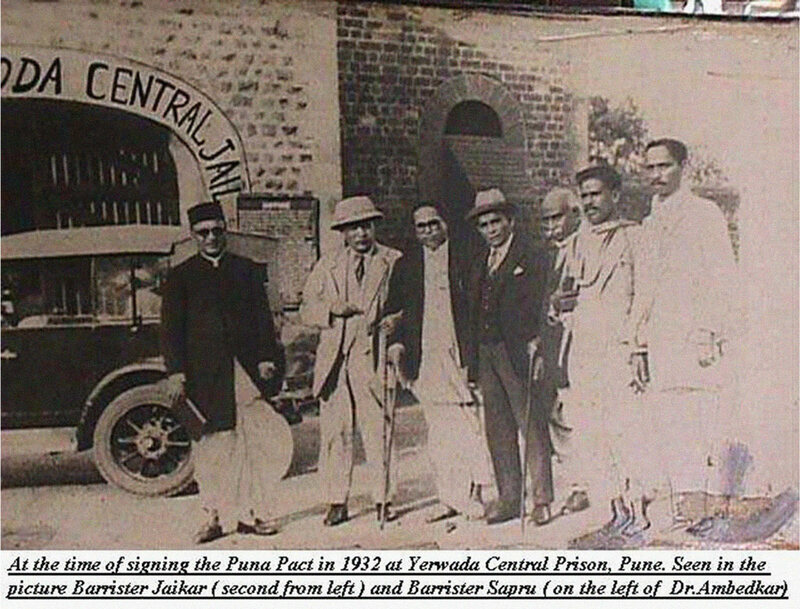 Ambedkar secured separate electorates for Untouchables; Gandhi opposed this and began an indefinite fast; Ambedkar was forced to compromise and signed the Poona Pact. 1935 Told Depressed Classes Conference that although he had been born a Hindu he would not die as one. 1936 Formed Independent Labour Party. 1942 Became member of Viceroy’s Council with Labour portfolio. 1942 Discontinued ILP and founded Scheduled Castes Federation. 1947 Became member of Constituent Assembly. 1948 Submitted revised Hindu Code Bill. 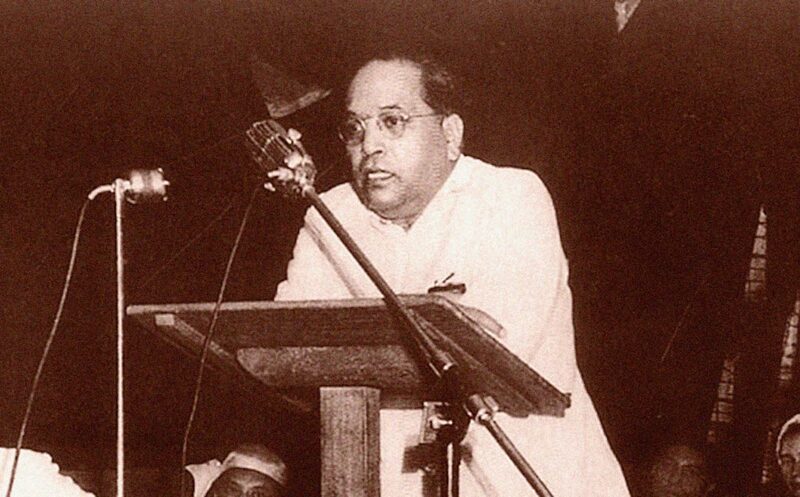 1951 Revised Hindu Code Bill failed at its final reading and Ambedkar resigned. 1951-1956 Mainly devoted his energies to studying Buddhism and exploring the idea of the conversion of Untouchables. History bears out the proposition that political revolutions have always been preceded by social and religious evolutions… the emancipation of the mind and the soul is a necessary preliminary for the political expansion of a people. My final words of advice to you are educate, agitate and organize; have faith in yourself. With justice on our side I do not see how we can lose our battle. The battle to me is a matter of joy. The battle is in the fullest sense spiritual. There is nothing material or social in it. For ours is a battle not for wealth or for power. It is a battle for freedom. It is the battle for the reclamation of human personality. 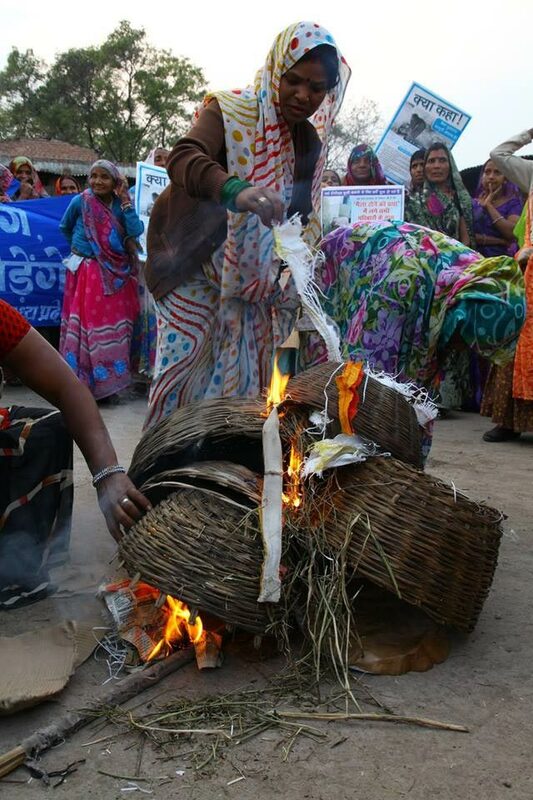 Dalit women burn baskets used to collect human waste as a sign of protest against the caste-based practice of ‘manual scavenging’, 2015. 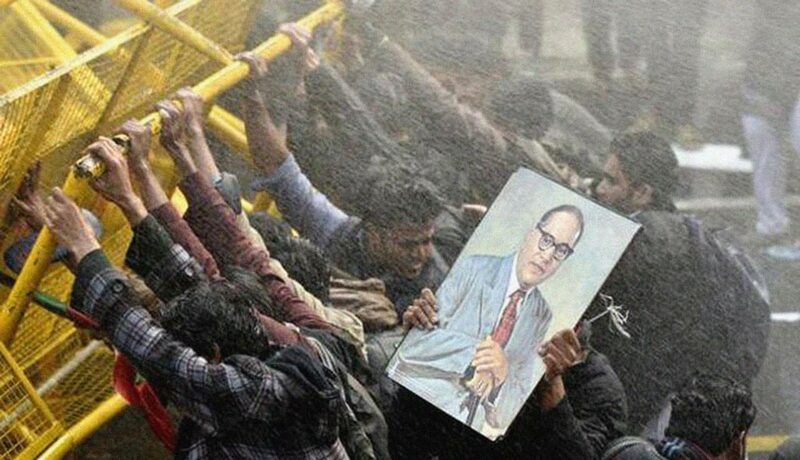 Students in Delhi resist water cannons while demanding action over Rohith Vemula’s suicide, 2016. For Dalits (formerly Untouchables), access to clean drinking water has always been a source of daily suffering and a potent symbol of their oppression. In 1927 Ambedkar led the Chowdar Tank campaign to gain access to drinking water from a Tank, an artificial lake, in Mahad municipality. Despite having a legal right to draw water from it, the untouchables were prevented by the caste Hindus from going near the tank and in March 1927 10,000 untouchable representatives attended a conference in Mahad. Led by Dr Ambedkar they walked in procession through the town to the Chowdar tank. There he took water from the tank and drank it – followed by the other untouchables. For caste Hindus this polluted the water and they attacked the untouchables and later ritually purified the tank. Now the dalit community is facing a boycott by upper caste villagers because they raised the issue of not being allowed to draw drinking water from the village well: “We are not only denied supply of essential commodities, but now they do not even give us water. Earlier, they would draw the water for us, but this has stopped now. We have to go to Bechraji town to buy water,” said Chiman Vaghela. If you want to organise, consolidate and be successful in this world, change this religion. The religion that does not recognise you as a human being, or give you water to drink, or allow you to enter in temples is not worthy to be called a religion. The religion that forbids you to receive education and comes in the way of your material advancement is not worthy of the appellation ‘religion’. The religion that does not teach its followers to show humanity in dealing with its co-religionists is nothing but a display of a force. The religion that teaches its followers to suffer the touch of animals but not the touch of human beings is not a religion but a mockery. The religion that compels the ignorant to be ignorant and the poor to be poor is not a religion but a visitation! A religion which discriminates between one of its followers and another is partial and the religion which treats crores of its adherents worse than dogs and criminals and inflicts upon them insufferable disabilities is no religion at all. Religion is not the appellation of such an unjust order. Religion and slavery are incompatible. Buddha stood for social freedom, intellectual freedom, economic freedom and political freedom. He taught equality, equality not between man and man only, but between man and woman. The fundamental principle of Buddhism is equality… There was only one man who raised his voice against separatism and Untouchability and that was Lord Buddha. I therefore solemnly assure you that though I have been born a Hindu I will not die as a Hindu. If you continue to remain in the fold of Hinduism, you cannot attain a status higher than that of a slave. For me, personally, there is no bar. If I continue to remain an Untouchable I can attain any position that a Hindu can… But it is for your emancipation and advancement that conversion appears to be very necessary to me. To change this degraded and disgraceful existence into a golden life, conversion is absolutely necessary… I have to start conversion to improve your lot. I am not at all worried about the question of my personal interest or progress. Whatever I am doing today, it is for your betterment and in your interest. My religious conversion is not inspired by any material motive. This is hardly anything I cannot achieve even while remaining an Untouchable. There is no other feeling than that of a spiritual feeling underlying my religious conversion. Hinduism does not appeal to my conscience. My self-respect cannot assimilate Hinduism. In your case change of religion is imperative for worldly as well as spiritual ends. Do not care for the opinion of those who foolishly ridicule the idea of conversion for material ends. Why should you live under the fold of that religion which has deprived you of honour, money, food and shelter? On 14th October 1956 in Nagpur Dr Ambedkar and his wife took the three Refuges and five Precepts from U Chandramani –the most senior bhikkhu in India. Dr Ambedkar then repeated the twenty two vows which he had written and in which he renounced all Hindu religious practices and vowed to follow the teachings of the Buddha. In a break with tradition, Dr Ambedkar himself then administered the same Refuges and Precepts to the 380,000 of his followers who had assembled in response to his call to convert to Buddhism. He then gave them the twenty two vows. 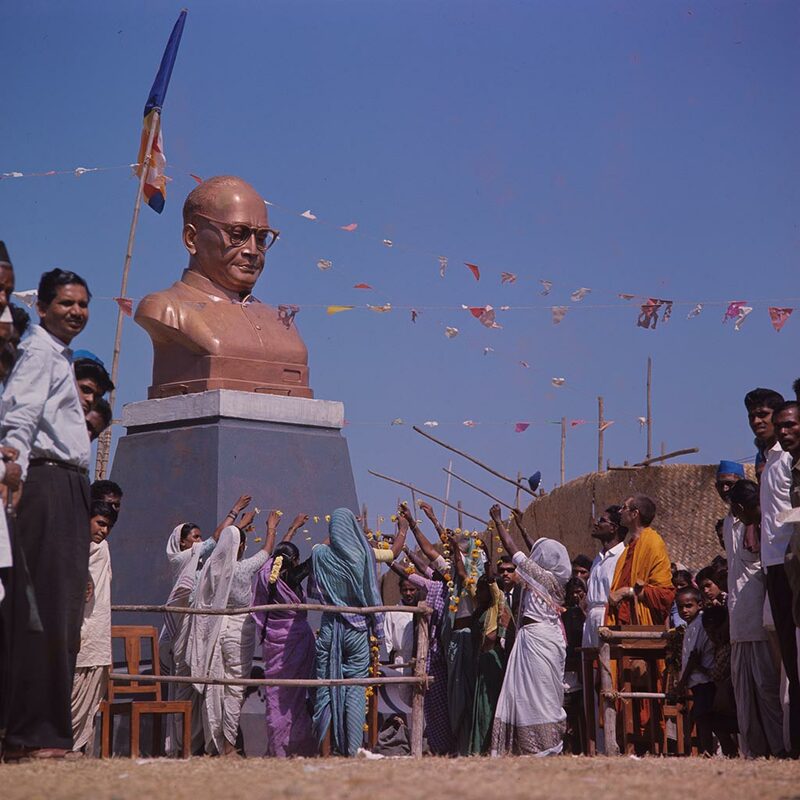 The following day a further 100,000 people attended a conversion ceremony at the Diksha Bhumi, led by Dr Ambedkar. 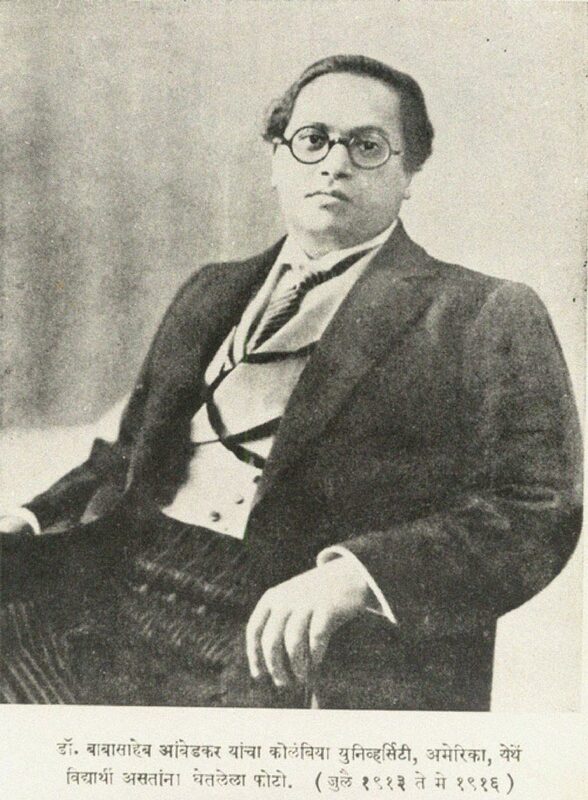 ‘I therefore solemnly assure you that though I have been born a Hindu I will not die as a Hindu’, 1935. Giving the 22 vows to his followers, 1956. 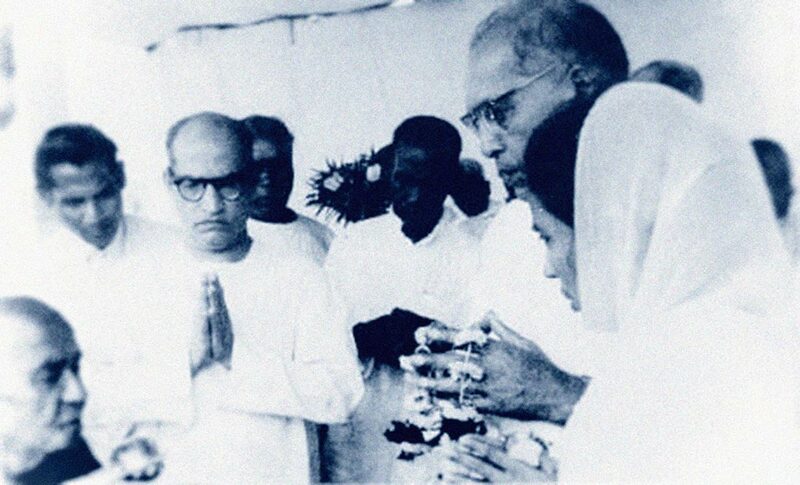 Dr. Ambedkar and Savita Ambedkar at the ceremony in Nagpur, 14 October 1956. If you continue to remain in the fold of Hinduism, you cannot attain a status higher than that of a slave. For me, personally, there is no bar. If I continue to remain an Untouchable I can attain any position that a Hindu can… But it is for your emancipation and advancement that conversion appears to be very necessary to me. To change this degraded and disgraceful existence into a golden life, conversion is absolutely necessary… I have to start conversion to improve your lot. I am not at all worried about the question of my personal interest or progress. Whatever I am doing today, it is for your betterment and in your interest. My religious conversion is not inspired by any material motive. This is hardly anything I cannot achieve even while remaining an Untouchable. There is no other feeling than that of a spiritual feeling underlying my religious conversion. Hinduism does not appeal to my conscience. My self-respect cannot assimilate Hinduism. In your case change of religion is imperative for worldly as well as spiritual ends. Do not care for the opinion of those who foolishly ridicule the idea of conversion for material ends. Why should you live under the fold of that religion which has deprived you of honour, money, food and shelter? 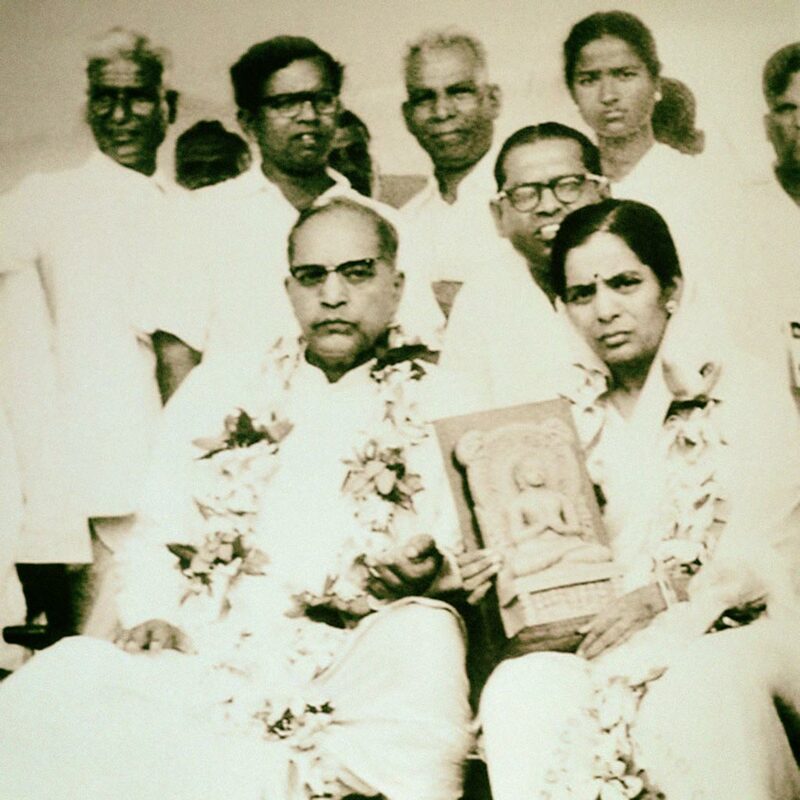 On 14th October 1956 in Nagpur Dr Ambedkar and his wife took the three Refuges and five Precepts from U Chandramani –the most senior bhikkhu in India. Dr Ambedkar then repeated the twenty two vows which he had written and in which he renounced all Hindu religious practices and vowed to follow the teachings of the Buddha. In a break with tradition, Dr Ambedkar himself then administered the same Refuges and Precepts to the 380,000 of his followers who had assembled in response to his call to convert to Buddhism. He then gave them the twenty two vows. Sangharakshita met Dr Ambedkar on three occasions and on the second Dr Ambedkar asked him how to go about converting to Buddhism. It was Sangharakshita who suggested that the conversion would have much more weight if it was conducted by U Chandramani, the most senior bhikkhu in India and the monk from whom Sangharakshita had received his own shramanera ordination. 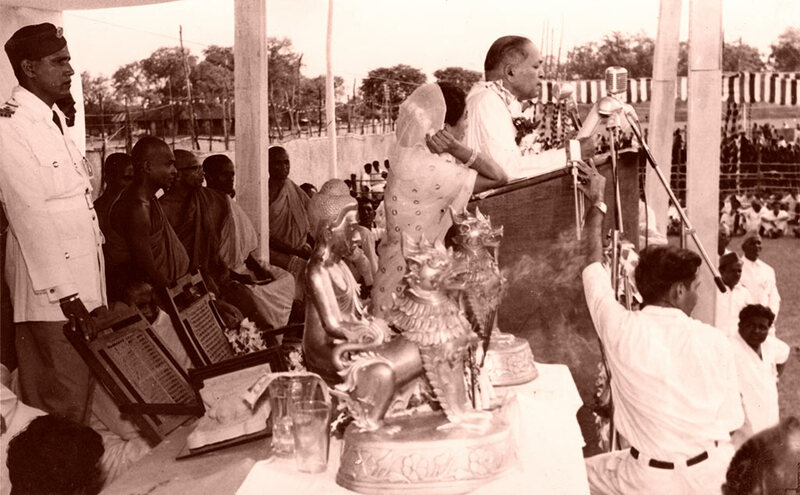 Sangharakshita, at Dr Ambedkar’s request, addressed 3,000 of his followers on ‘What it means to become a Buddhist’. Poor and illiterate as the majority of them were, and faced by the unrelenting hostility of the Caste Hindus, they did not know which way to turn and there was a possibility that the whole movement of conversion to Buddhism would come to a halt or even collapse. Sangharakshita addressed 100,000 of them in Kasturchand Park that night and urged them to have hope and continue the work that Dr Ambedkar had begun. Never before had I seen the Three Refuges and Five Precepts taken with the sincerity, zeal and fervour that I saw them taken by the ex-Untouchables… I could see from the light in their eyes and the rapturous look on their faces… the ex-Untouchables were giving expression to their heartfelt conviction that Buddhism was their only hope, their only salvation. After Sangharakshita’s return to England, he made four teaching and speaking visits to India. Trailokya Bauddha Mahasangha, later Triratna Buddhist Community, founded. 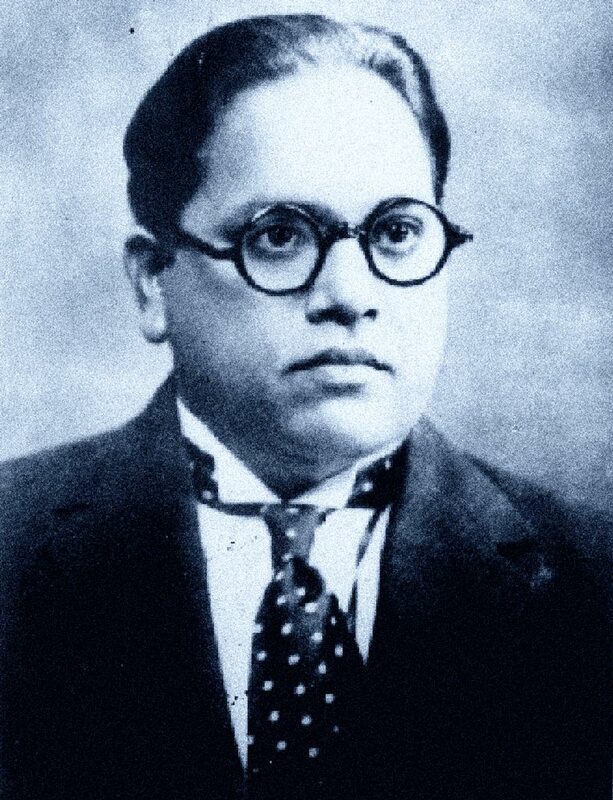 I [was] more than ever convinced that my approach to Buddhism was in line with that of the great Untouchable leader and that the new Buddhist movement with which so many of Ambedkar’s followers were now in contact was a direct continuation of his own work for the Dharma. ‘But though Bhimrao Ramji Ambedkar had been a Buddhist for only seven weeks, during that period he had probably done more for the promotion of Buddhism than any other Indian since Ashoka. At the time of this death three quarters of a million Untouchables had become Buddhists, and in the months that followed hundreds of thousands more took the same step – despite the uncertainty and confusion that had been created by the sudden loss of their great leader… This was Ambedkar’s last and greatest achievement, so that even though it was as the Architect of the Constitution of Free India and the Modern Manu that he passed into official history and is today most widely remembered, his real significance consists in the fact that it was he who established a revived Indian Buddhism on a firm foundation. It is therefore as the Modern Ashoka that he really deserves to be known, and the statue standing outside the parliament building in Delhi should really depict him holding ‘The Buddha and His Dhamma’ under his arm and pointing – not for the benefit of the Untouchables only, but for the benefit of all mankind – in the direction of the Three Jewels’, Sangharakshita. 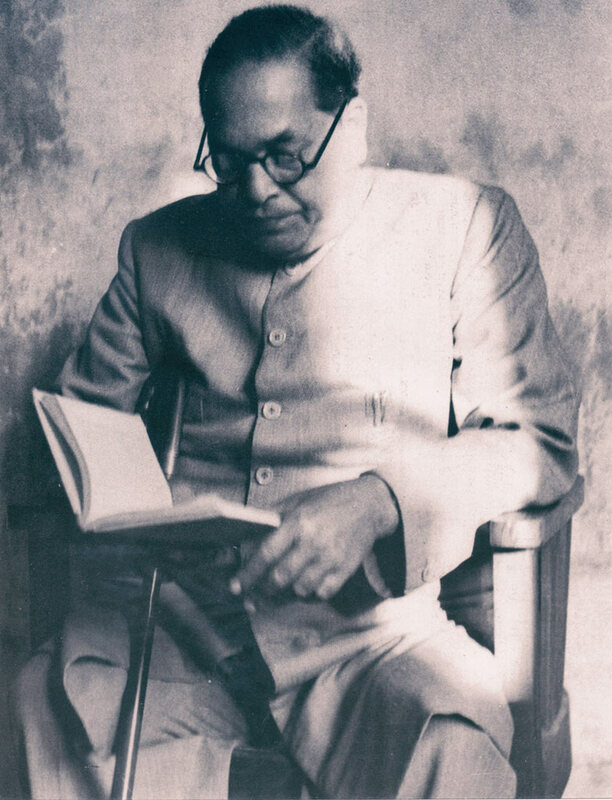 ‘Wherever I went I moreover saw, as I had seen time and time again all those years ago, how overwhelmingly grateful Ambedkar’s followers were for whatever Buddhist teaching they received. This time, however, they would not have to wait for years before they heard another lecture on Buddhism. 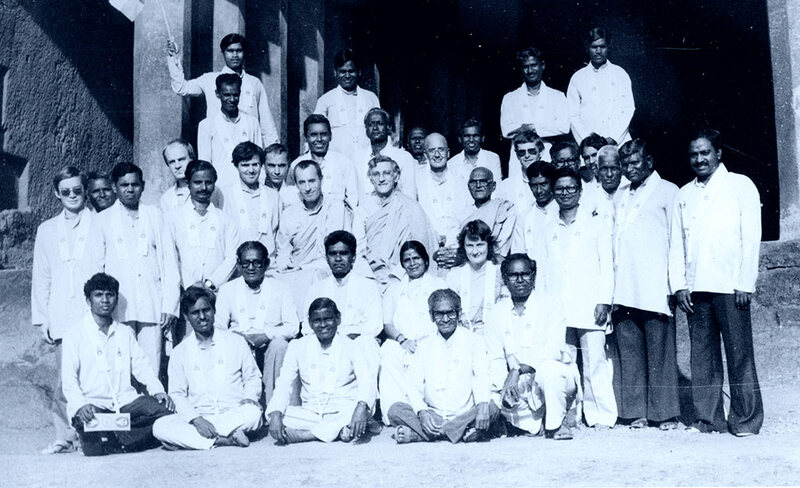 This time they were in contact with a new Buddhist movement, a movement that was the direct continuation of Ambedkar’s work for the Dharma, so that even after I had gone there would be plenty of opportunities for them to hear lectures, to learn how to meditate, and to go on retreat. 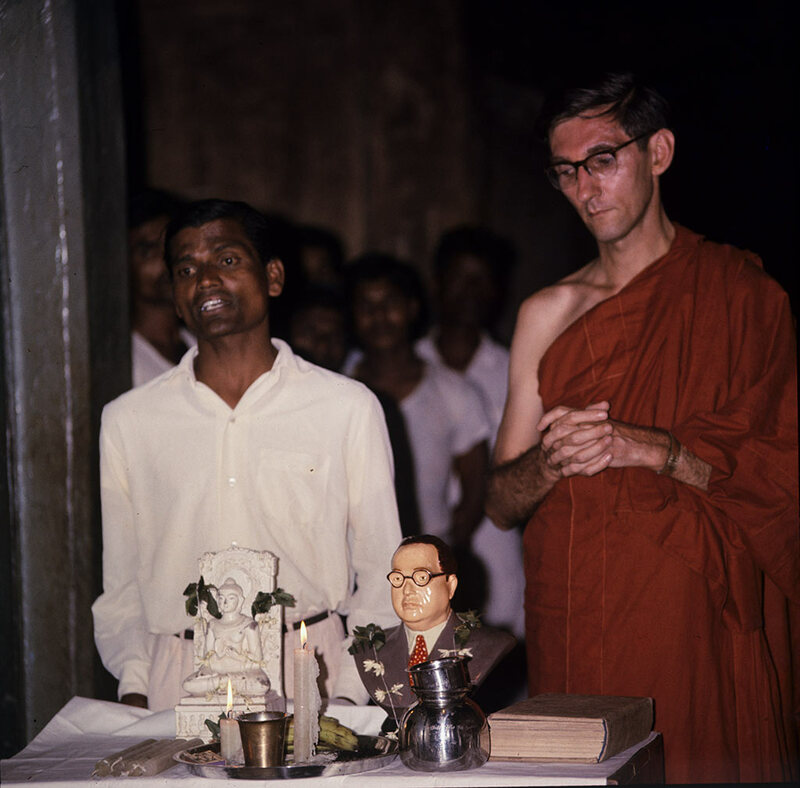 There would, in short, be plenty of opportunities for them to practise Buddhism, and it was in the individual and collective practice of Buddhism that – Ambedkar believed – they would find the inspiration which would enable them, after centuries of oppression, to transform every aspect of their lives’, Sangharakshita writing about a teaching tour in the winter of 1981-82. What Doctor Ambedkar Means To Me?